In America and in the world today, we are all vulnerable to a greater or lesser extent. Walking the streets and roads, you see it in our faces and hear it in our voices. The vulnerability specter hangs as well over our families and friends every day. To an even greater extent, we will be vulnerable in the future unless we fix what is broken and build a survivable and thriving future. 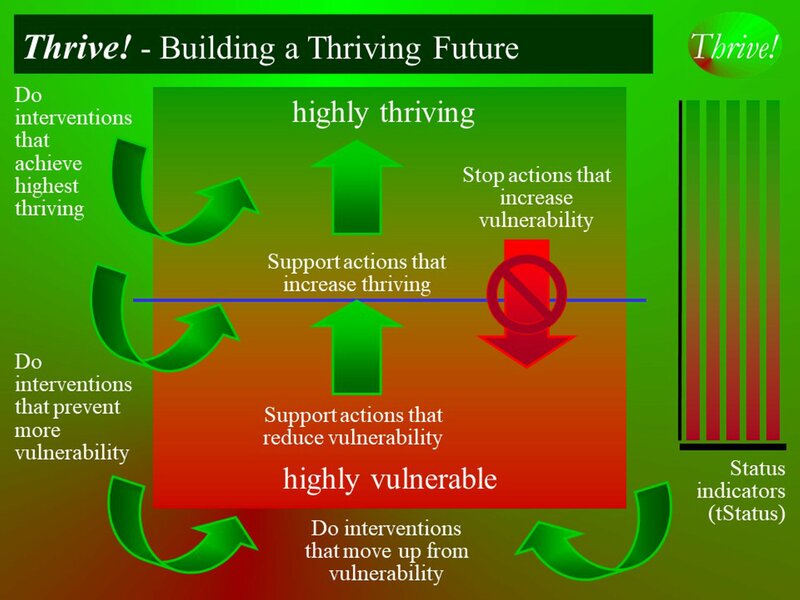 We need to minimize vulnerability via policies that stop forces that push us down to be more vulnerable and support forces that lift us out of vulnerability and toward thriving. We have "next generation" knowledge and tools. We know how to design and operate human systems that support individuals and achieve our vision. We have information and tools to take complex, cross-cutting programs and tailor them as an integrated solution for each person consistent with multiple policy goals. We better understand human behavior and its determinants. Thrive!, as a strategic local, national and global approach, can and does reduce vulnerability if we have the wisdom and will. If we do and apply them successfully, we achieve the sustainable vision of minimizing our vulnerability and maximizing our thriving.